A bond between a sister and a brother is a special bond and it becomes extra special when you make her feel like a princess and shower your love via gifts that can simply warm her heart. With Bhai Dooj celebration around the corner, you can make her feel really special with awe-inspiring gifts from FlowerAura that include everything from beauty hampers to wallets, chocolates and many more. Bhai Dooj is a special occasion to celebrate the special and strong bond between a brother and a sister. The sacred festival of Bhai Dooj is marked with many traditional rituals where a sister applies a tilak or tikka on the forehead of her brother and prays for his well being and prosperity. So, on Bhai Dooj as a brother you should also express your emotions and adoration towards your loving sister so as to make her feel valued and important with a meaningful gift. But, if you haven’t still found a perfect gift to adore your lovely sister then, fret not, because FlowerAura brings you a mesmerizing collection of Bhai Dooj gifts for sisters which will surely delight your sister. We have a delightful range of unique and fancy Bhai Phota gifts for your sister that will express your love, care, and affection for your sister. You can choose from our alluring and attractive range of Bhai Dooj gifts like assorted chocolates, cushions, jewelry, wallets, beauty products, mugs, greeting cards, aromatic flower, amazing combos, and many other creative gifts. Some of the best gift hampers for your sister available on our website are the Black statement, Rich glow hampers, Blushing beauty, Beautiful flowery wallet, Matt bead necklace, Fashionista’s dream, Charming chocolaty treat, Sweetness ka overdose and much more. Apart from these, we have personalized gifts that are sure to convey your emotions to your sister in the most beautiful manner. From cushions to lamps, mugs to photo frames, our range of customized gifts are sure to love by you. We understand that finding a perfect Bhai Phota gift for your sister is not an easy task. Firstly, you have to decide what to pick and what to not. Secondly, you have to go out and stroll around to find a thoughtful gift for your sister. But, no more. Now, you don’t have to go outside to buy a Bhaubeej gift for your sister. You can simply order a Bhai Phota gift for your sister online from us comfortably seated at your home. All you need to do is visit Floweraura.com, check out our wonderful Bhai Dooj gift ideas for your sister, pick the best gift for Bhai Dooj, and place your order. Within a few clicks, you can order the best gift for your sister on Bhai Dooj and make her feel special in an amazing manner. So, make this auspicious occasion of Bhai Dooj a joyous one for your sister with a meaningful gift from us. We ensure an impeccable delivery service to our customers. 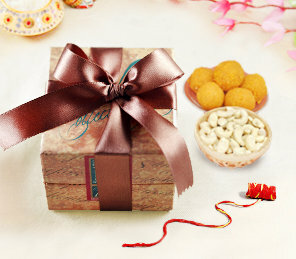 Now, ordering or sending a Bhai Dooj gift for your sister is completely hassle-free. You can avail our same day delivery service in case you want your gift for your sister to get delivered on the same day of your order placement. If you want to gift your sister an everlasting memory then, you can surprise her by sending a gift at midnight via our midnight delivery services. You can also opt for a next-day delivery in case you are not comfortable with the other delivery options. Along with our hassle-free delivery services, you can also enjoy a free shipping benefit with us. So, reach out to your beloved and beautiful sister this Bhai Dooj by sending her cherishable tokens of togetherness from FlowerAura. Here’s wishing you and your siblings a very happy Bhai Dooj!